Thomas Mair showed no emotion as he was found guilty of the murder of Batley and Spen MP Jo Cox and jailed for life. Jurors at the Old Bailey had also found the 53-year-old guilty of possession of a firearm with intent to commit murder, possession of an offensive weapon – a dagger – and causing grievous bodily harm with intent to Bernard Carter Kenny. Batley and Spen MP Jo Cox, who was murdered by Thomas Mair on June 16. 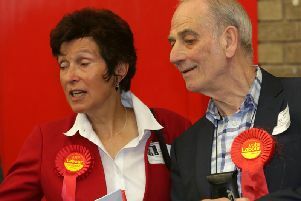 Mr Kenny, 77, had tried to intervene when he saw Mair attacking 41-year-old Mrs Cox outside Birstall Library on June 16. “In the true meaning of the word she was a patriot. You affect to be a patriot. He added that Mair had not had the courage to admit what he had done. Prosecutor Richard Whittam, QC, said it has always been the Crown’s case that Mrs Cox’s murder was a “politically motivated killing”. The court heard judge Mr Justice Wilkie can impose a life sentence, but would have to impose a minimum term. Mr Whittam read a victim impact statement on behalf of Bernard Kenny. Mrs Cox’s widower, Brendan Cox, took to the stand to deliver a statement. He had been in court with Mrs Cox’s parents, Gordon and Jean Leadbeater, and sister, Kim Leadbeater, this morning. Mr Cox said: “We have no interest in the perpetrator. We only feel pity for him... we are here because we want to tell you about Jo. What she was and what she meant to us. He told the court that he believed her killing was an act of terrorism. Mair, of Lowood Lane, Birstall, shot and stabbed mother-of-two Mrs Cox as she arrived at the library in West Yorkshire for a surgery on June 16, a week before the EU referendum. The court heard he shouted “Britain first”, had a stash of neo-Nazi material at his home and had collected a dossier on Mrs Cox, who was supporting the Remain campaign. At the conclusion of the prosecution case, Mair’s barrister Simon Russell Flint, QC, called no evidence on behalf of Mair. He went on to detail the initial attack on the Batley and Spen MP by defendant Thomas Mair. He said: “Most likely Jo Cox was shot once in the head followed by a brutal attack with a dagger.